DANILENKO Sergey, Doctor EMC. Make an appointment, ask a question. 2006 - State Educational Institution of Higher Professional Education "Buryat State University", specialization "medical care". 2009 - Clinical residency. State educational institution of higher professional education "Buryat State University", medical department. Specialty: surgeon. 2013 - Moscow Medical Academy named after I.M. Sechenov, department of postgraduate education for physicians. Specialty: a physician of roentgen-endovascular methods of diagnostics and treatment. 2008-2013 - physician of roentgen and endovascular methods of diagnostics and treatment, SBI Republican Clinical Hospital n.a. O.N. Semashko, Ulan-Ude, Republic of Buryatia, Department of roentgen surgical methods of diagnostics and treatment. Since 2013 - a doctor of roentgen-endovascular methods of diagnostics and treatment, SBHI Municipal Clinical Hospital n.a M.E. 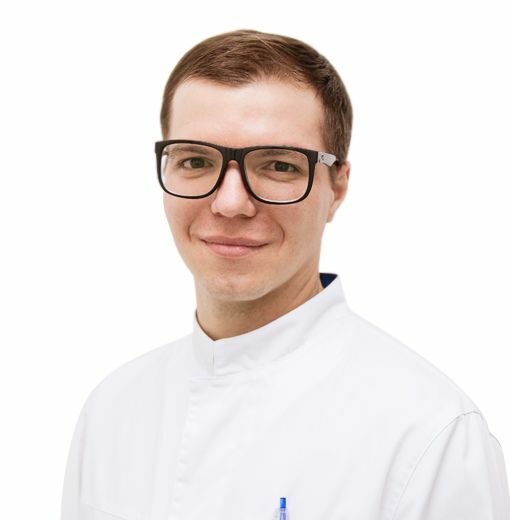 Zhadkevich of Moscow City Health Department, department of cardiovascular pathology with the office of roentgen surgical methods of diagnostics and treatment. Consultation and management of outpatient and inpatient patients with the cardiovascular diseases. Carrying out the complex of diagnostic and therapeutic measures including angiography of coronary, peripheral, carotid arteries. Diagnostic procedures - selective coronary angiography, shuntography, thoracic and abdominal aortography, left and right ventriculography, pelvic and peripheral arteries of the lower extremities arteriography, carotid arteries, arteries of the brachycephalic trunk, cerebral arteries, heart cavities catheterization. Carrying out of percutaneous coronary interventions with coronary arteries stenting, aortocoronary shunts, peripheral arteries angioplasty. Сarotid arteries and magistral arteries of the lower extremities stenting. Transcatheter closure of the interatrial septum defect and open aortic duct. Assistance in endoprosthetics surgeries in aneurysms of the thoracic and abdominal aorta. Implantation of one-, two-chamber pacemakers, electrostimulator-defibrillators, implantation of resynchronizing devices. The author of more than 10 printed articles.